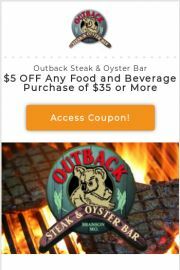 If you’re looking for the best Branson Outback Steak & Oyster Bar coupons, you’re in the right place! Located on the Branson Hwy 76 “Strip” for your convenience is the Outback Steak and Oyster Bar. Open daily, 11am to 9pm weekdays and 11am to 10pm on weekends. Remember to relax by the fire pit on the patio with your favorite beverage Mate! Come enjoy our live entertainment!